Wyman Plumbing is proud to announce that for another year we’re in the running for Bradenton Herald’s People’s Choice Awards in two categories! Vote online for 2018’s Choice Contest! Do you love Wyman Plumbing? Click on the picture below and navigate to the “For Your Home” category to vote for us in both the Plumber and Plumbing Supply Store Categories. Not only will your vote help us to be the number 1 in both categories again, but if you vote online between now and January 30th at midnight, you will be entered to win a $500.00 cash prize! Wyman Plumbing is proud to be a sponsor of the upcoming Beertopia! This is one of the best fundraisers of the year! The event features great live music, craft beer from around the world, some of the finest local cuisine and an impressive selection of silent auction and raffle items. It is a fun evening and a great way to support the children of Manatee County. 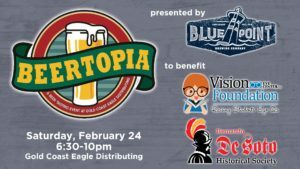 Beertopia is an annual fundraiser to benefit Eye Center Inc.’s Vision Foundation and the Hernando DeSoto Society. This non-profit organization is committed to providing eye care and glasses to underprivileged children in Manatee County, FL. Its purpose is exclusively charitable. Through generous donations and events like this, the vision foundation is able to provide free eye examinations as we;; as a complete set of glasses to any Manatee county student in need. The Vision Foundation also supports and provides glasses to the patients at Turning Points in Bradenton, FL. Be sure to save the date for this fun event which takes place Saturday, February 24 from 6:30 PM – 10 PM at Eye Center, Inc. 2003 Cortez Rd W, Bradenton, Florida 34207.